On the way back from an attempt to hike up the Pedra Selada in the Serra da Mantiqueira and ended up spotting a couple of Carcará eagles. See the eagles in the pine trees? The Pedra Branca Massive is with its 12 hectares of rain forest clad mountains currently the biggest urban forest in the world and one of the best places for experienced hikers in the city of Rio de Janeiro. When travel writer and photojournalist Mark Eveleigh asked me if I had some trekking ideas for hikes close to Rio de Janeiro, I first took him on a tour around the Tijuca national park, which has good infrastructure and a few great hikes for everyone’s liking. “So what about Pedra Branca forest?“, was his next question… I had to admit that I hadn’t checked that one out yet, but after some online research, I found out that the park had some very interesting hiking possibilities, the toughest of which is a 8,5 km hike to the “Pico da Pedra Branca”, the highest point of the park, and with 1.025m also the highest point of the entire City of Rio de Janeiro. Few people know that the city of Rio de Janeiro is home to the two biggest urban forests in the world. The Tijuca Forest used to be the biggest one for a long time, until expansion of the city’s territory led to the annexation of some of the neighborhoods west of the Pedra Branca Massive like Campo Grande and Santa Cruz. From then on, Pedra Branca became the biggest urban forest in the world. However… Tijuca forest still has the title of biggest man-planted forest. With its 125 km², Pedra Branca is a section of Atlantic rain forest, almost three times the size of the Tijuca forest. Just like the Tijuca forest it is a rugged, mountainous area with dense tropical vegetation and peaks up to 1025 m. Its “ruggedness” and steep slopes saved this area (as well as about 100.000km² in other areas all over Brazil) from becoming farming or cattle land. I had to leave Volta Redonda around 3.30 am and drive about 120 km to pick up Mark at 7.00 am in Ipanema. From Ipanema it is another 40 km to the east entrance of the park in Jacarépagua. In a cabin at the entrance, there are two guards and you need to register your name and ID and tell them where in the park you are intending to go. When I said that we were going to the Pico da Pedra Branca, the guards looked at us and said that we were sure going to return with scratched up legs. According to them, the trail was very “fechado”, meaning that it was overgrown with vegetation and barely visible at some places. They also told us that, different from the Tijuca forest, the trails at Pedra Branca have no indications, apart from a few arrows carved in trees. This sounded like it could turn out to be a real adventure hike. I had brought my Garmin 60GSx, which is perfect for this kind of situation. I would record our progress, and when in doubt we could just trackback, so even if we wouldn’t be able to find the way to the top (yeah, right…), getting back would never be a problem. I activated the GPS to start recording, and after a few last pointers from the guards we took off. Pretty soon the trail became confusing. We were supposed to cross the river somewhere, but there were several tracks leading to the river, and none of them seemed to continue on the other side. After some backtracking, we eventually found the crossing and the trail started to climb steadily from there.To make up for the lost time, we kept going at a fairly fast pace, even uphill. 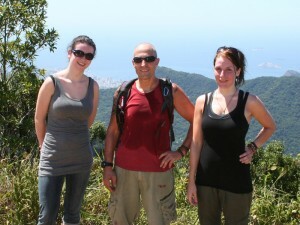 This was a very different hike than the one in Tijuca National Park. The guards were right. There was no signalization and the trail was quite hard to find sometimes. We had to look for signs like branches that were cut off, that indicated where the trail had been cleared at one point. Also, November is springtime in Brazil, meaning that the vegetation is growing quickly and the trail closes up faster than the people can keep it open. Another big difference with the pico da Tijuca hike, was that this trail starts almost at sea-level, while the Tijuca trail starts at an altitude of almost 700m. The Tijuca trail is also a lot shorter. So, while Tijuca is a fairly easy 3 km hike on a trail that is well indicated and maintained, covering a difference in altitude of about 350m, the Pedra Branca trail is a 8.5km of dense jungle, with close to no indications climbing about 1000m. Making our way through the dense vegetation, we didn’t see a lot of animals, besides birds and butterflies, but we were able to tell there were animals, probably Coatí and Porco do Mato (Peccary) through all the noises we heard all around us… and the animal droppings we found in lots of places along the trail. At a given moment, I heard a ruffle a few meters in front of me and I saw a green snake slithering from right to left across the trail, disappearing in the thick growth. These Green snakes (or Cobra Cipó) are considered nonpoisonous, but in reality they posses a strong poison. However, their non-aggressive nature (they usually flee very quickly) and the fact that the fangs are located in the back of their mouth result in very low accident statistic. I guess you can understand that I’m always kind of dumbfounded to see people (usually Brazilians) in flip-flops and beach attire hopping around in these jungle environments. There was a guy -apparently living there – with a bunch of dogs. It was not immediately clear what his role was, but I guess he is some kind of caretaker of the Casa Amarela… we chatted for a while, had a few bananas and were on our way again. It was there and then that I realized that I had left my camera in the car… Damn!One of the way-points (actually, the only one), somewhere halfway the trail to the top, is the “Casa Amarela”, a building that was once the main house of a “sitio” called Santa Barbara. (sitio = small farm – bigger than a Chacara, but smaller than a Fazenda). The fact that we arrived there meant that we were on the right track… Yey! The guy told us that it would be about one more hour walking to the top. He also said that from here the trail would become even steeper… which sounded fine to us. There was a barbed wire fence going up the slope, which made it easy to follow, and after a while we reached the only clearing of the whole trail where you can get a glimpse of the surrounding landscape. This is very much a hike for people who want to enjoy the time in the forest and don’t care so much about the visual aspect. We checked out the place to see if there was someone (apart from the donkey that was going about his business of grazing quietly) to ask the way, but the place was deserted. We went back and eventually Mark discovered the trail… We had walked right passed it without even noticing. Another indication of how easy it is to get lost in these forests. Luckily there’s enough bamboo around and that’s how we were able to get on top of the boulder where Mark could take a few photos. During the hike to the top, I had noticed that I hadn’t cleared my previous data in the GPS, so I had no correct idea of the distance that we had already walked. At one point, Mark mentioned to “reset” the data in the GPS once we would reach the top and then the GPS would record the correct distance as we would backtrack down the mountain… mmm… good idea. I saved the track and cleared the recorded data, but the numbers were still not reset to zero. I thought I had done something wrong and repeated the procedure… this time I saw all zero’s. Ok, we were set and ready to go!! First, we sat down for about 15 minutes to have lunch (more bananas :)) before setting out to start the descent… which would not be a walk in the park either… Some sections were really steep to climb up, so descending these sections would be a tough cookie on calves, shins and knees. I wanted to load up the saved track into the GPS to start backtracking, but to my surprise, the track was no longer in the database… WTF?? I checked again, nothing… restarted the GPS… nothing… Ok, this was not very good news. Mark had even said at one point to make sure I would not delete the track, and I had reset the GPS data before with no problems, but somehow I had managed to delete EVERYTHING… Saved tracks, routes, waypoints… the GPS was as empty as the Greek treasury …. From my online research, I remembered that there were several entrances to the park, and one of them was in Campo Grande. The GPS was still doing a perfect job as map and compass and showing me where we were, and I suggested that the path leading to the left from the T-section might be the one leading to Campo Grande… It was a hunch and the route to Campo Grande was 11,5 km instead of the 8,5 to Jacarépagua, but that would still be better than spending the night in the forest. We decided to take that route, although it meant that we didn’t know where (in what kind of neighborhood) in Campo Grande we would end up. Also, from Campo Grande we would have to find transportation back to the car in Jacarépagua on the other side of the mountains, which would be a 35km bus, van, taxi (whatever) ride… Our plan to get back in Ipanema by 5.00pm went straight down the drain. This trail was a lot more open, so we had good visibility over the surroundings almost the whole time, which made it easier to navigate. After 1,5 hours we started to see some chacaras, and that was a great thing, because the people living in the chacaras would have to have a road to get to Campo Grande to sell their products. At a given moment we encountered an old man on a horse making his way up the mountain. I made him stop and asked if we were on the road to Campo Grande… He started saying a lot of things, but because about 95% of his teeth were gone, it wasn’t easy to understand him. We continued on the same trail, which was very tough at some places, making me feel sorry for the horse. Having a beer and talking to the locals after making it out of the forest… The man next to me is 73 years old, came to Brazil with his father from the island of Madeira when he was 10… Worked in the field his whole life and never learned to read or write. There was a guard at this side of the park as wall, and I asked him to call his colleagues in Jacarépagua to advise them that we were on the other side, but he said that he didn’t have a phone, and even if he would, he didn’t have any contact information of his colleagues. Even though I found that a little strange and very unprofessional, I can’t say I was surprised… After all, this is Brazil, right? Located in the bay of Angra dos Reis, about 100 km west of Rio de Janeiro, Ilha Grande (Big Island), with its many secluded, sandy beaches, Atlantic rainforest and relaxed way of life, is a popular weekend and holiday destination in Brazil. During the colonial period of Brazil, 400-500 years ago, Ilha Grande was a popular hideout for pirates, who used the island as a base for attacking the ships that carried gold and diamonds from Paraty to Rio de Janeiro. In the 18th century it became a base for slave traders and a prison, which only closed in 1994. After the prison closed, the island was turned into a natural reserve and this paved the road for the tourism that today is the major source of income for the inhabitants. A typical schooner… Great way to do the crossing to Ilha Grande. People who get seasick easily, are better off taking one of the bigger ferries. You can only get to Ilha Grande by boat, leaving from the ports of Angra dos Reis or Mangaratiba. The trip is about 1,5 hours and can be done by ferry or, a liitle more bumpy and adventurous, by schooner (my favorite). You arrive at the village of Abraao, Ilha Grandes major port/ hub, where most of the hotels and pousadas are located. Once on the island, you get around on foot or by small boats, that take you to the various beaches around the Island, or on a snorkeling or fishing trip. There are several hiking trails on the island. Starting from Abraao, you can just go a few kilometers to the next beach, or hike around the island in five to ten days, camping along the way. It is recommended to take a guide when going on a extensive hike. More than once, people have gotten lost in the dense forest. 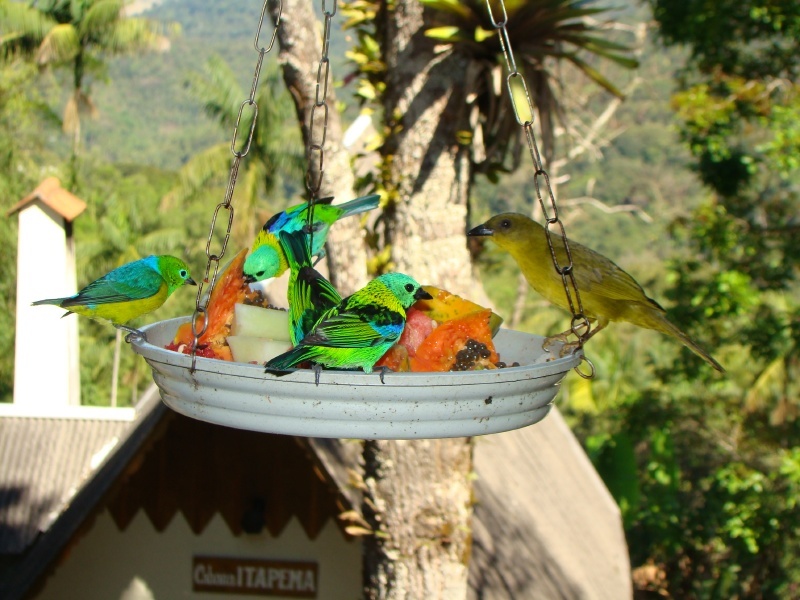 One of the popular attractions on the island is the “Pico do Papagaio“, a mountain with a top in the shape of a parrot’s beak. The hike to the summit (almost 1000m) is considered heavy and again, should only be attempted with a guide. Lopes Mendes beach on Ilha Grande. One of the most beautiful beaches on the Island. Even in high season there’s plenty of space for everybody. Other hiking destinations are the beaches “Lopes Mendes”, “Dois Rios” and “Praia do aventureiro”, all located on the south side of he island. The clear waters around Ilha Grande and the smaller islands in the surrounding area make for a great number of terrific diving spots. In the village of Abraao you’ll find several agencies that offer diving trips all around the island, some of them have English speaking staff and instructors. A few of the most popular spots are: “Gruta do Acaiá”, “Ilha dos Meros” and “Ilha do Gurirí”. More info on this site (Portuguese). If you’re not a scuba diver, snorkeling is another way to enjoy the awesome underwater scenery. You’ll find various places where you can rent a mask and flippers. Important: When you plan a stay on Ilha Grande, make sure you stock up on cash, since most pousadas, restaurants and shops don’t accept cards and there are no banks or even ATM’s on the island. Other than that, you won’t see any cars (except of the police and fire department) or supermarkets, and you also won’t be able to use your mobile phone. In other words, everything is pretty basic on this tropical island paradise, but not having all these things is really part of the attraction. It was on one of my first motorcycle road trips, exploring the dirt roads of the “Vale do Cafe” after arriving in Brazil in early 2009, that I missed a right turn and ended up crossing the state border between Rio de Janeiro and Minas Gerais, that I got to know a hidden little gem of a village called Santa Rita de Jacutinga, or short: Santa Rita. The village only recently started to discover and develop its touristic potential so it has nothing of a typical touristic place, like for instance Tiradentes, one of the most famous historical villages, which gets its income almost only out of tourism. When I arrived there the first time in 2009, access to the village was only via dirt road. Today this has changed: two asphalt roads, one to the south and one to the north, make the village more accessible for visitors. Santa Rita, also known as “a cidade das cachoeiras” or “city of waterfalls”, as the name implies, is famous for its more than 70 waterfalls scattered across an area of almost 500 km². A great way to discover the most important ones is on horseback, but it can also be done by car (preferably a 4×4) or during a mountain bike or hiking trip, during which you will be blown away by the beautiful sights around each curve in the road, or the flocks of colorful birds you will encounter. 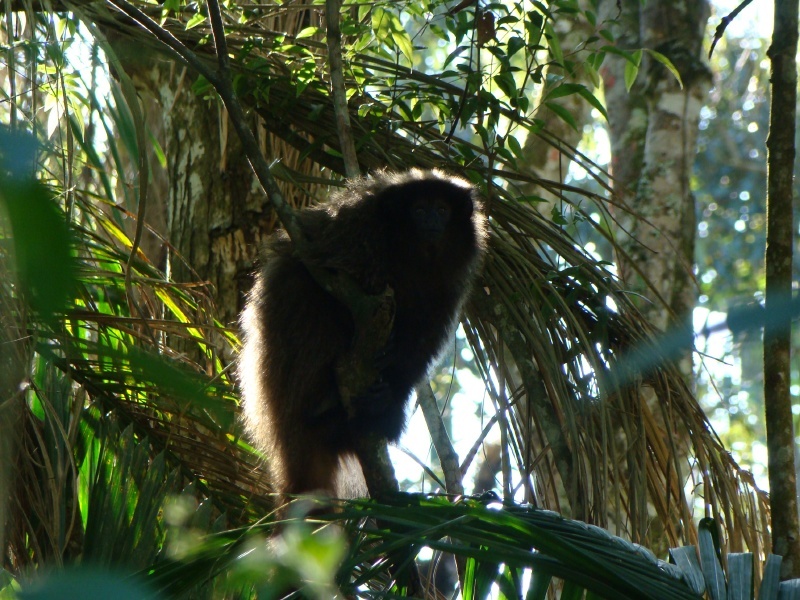 Besides birds, there are a lots of other forest animals you could run into here: monkeys, Coatis and various kinds of reptiles like lizards and snakes… the latter potentially dangerous, so better stick to the trails when you’re hiking. Fazenda Santa Clara… During the 18th century its main activity was the production of slaves. Unlike the more touristic places in the region, and again, due to the fact that tourism is a fairly new phenomenon here, Santa Rita doesn’t have a lot of accommodation (yet). there are 6 pousadas in the center, and 6 more outside of the village (max 8km from the center) Here is a link to a map showing the points of interest and places to stay in the wide area. One of the most important historical attractions in the region is the 18th century “Fazenda Santa Clara”, about 20 km of – sometimes precarious – dirt road from Santa Rita. This gigantic farm was built on top of a hill and almost resembles a medieval castle. It has 90 rooms, 12 of which are salons, and 365 windows, lots of them just painted on the white walls. Sinister detail: this farm’s primary activity was not growing coffee or raising cattle, but the production of slaves… After the abolition of transatlantic slave trading in 1836, fazendas like these were providing the huge coffee fazendas in the area with new slaves, until slavery was finally abolished in Brazil in 1888. Visiting the fazenda, and seeing the places where the slaves were kept, and sometimes tortured, compared to the luxurious quarters of the owners, leaves a very strong impression. The many rivers in the region make great playground in a lush green environment… again, a paradise for kids.